Facebook, the most famous social networking app across the globe is leaving no stone unturned. It recently revamped its Events app and renamed it Facebook Local. Facebook has launched this app as a competitor to the local event and business listing services like Yelp which are already prevalent in the market. Facebook rolled out Facebook Local on Friday. It is a combination of Yelp, Foursquare, and Events app. 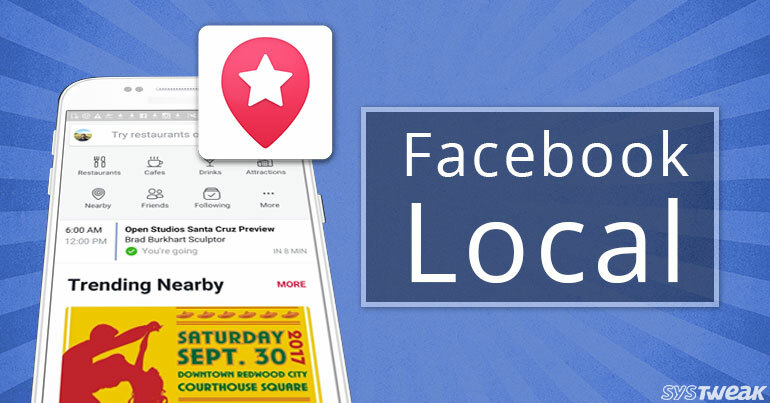 Currently, Facebook Local is available for both iOS and Android devices in the US. This app is a mesh of information that relates to the local businesses, events and places where your friends check in. Facebook Local also lists local bars and restaurants along with their reviews. Users can also look for local business as well as be informed about the activities of their friends and family. The first step to use Facebook Local is to install it on your iOS or Android Device. For this, download and install it from Google Play Store or App Store. Once you have installed the app, launch it. The Home page lists ample shortcuts where you can see the nearby cafes and restaurants. You will get to know about the places where you can enjoy some wonderful drinks and major attractions. There is a shortcut to view the activities of your friends based on their preferences for restaurant events etc. The Home page also shows a list of your day’s schedule and activities that are trending in the nearby vicinity. This may include music shows, food events, live concerts etc. While searching for restaurants, users get the option to sort options based on Relevance, Popularity, Distance and Ratings. Users can apply the filters as per preference and get the best results. Facebook Local also provides users three filters using which users can narrow down the options as per needs. Upon activation of these filters, Facebook local display results based on which restaurants are open and are liked by their friends, and also prioritized according to the relevance. The main page of Facebook Local has an option called Events. Events let you know about the trending events happening around you. Upon selection of a particular event, it gives a detailed information about it including the date when it is supposed to happen, the location and time of the event. It also gives users the information of the ticket amount etc. The Events tab also displays all the events about to happen in the next 7 days. For any selected date, it displays a list of events happening that day. Users can also choose to get a map overview of the events. When opted, Facebook Local will present a map to you that encompasses all the nearby events happening. Users can also add the chosen event to the calendar to make sure they do not miss any event or dinner. Though we don’t know when Facebook Local will be available worldwide, we are sure people in US are going to like this app a lot. It offers a lot to fulfil user’s requirements owing to the busy schedule they have. This is going to help them find the best place to spend their free time. Bitcoin: The Future of Money or A Prophet of Anarchy?